Sign Up, It's Free For 14 days. A robust, purpose built software for small-mid size auto body shops. Discover why thousands of small-mid size auto body shops use Web-Est auto collision estimating software. Estimators can have rates for your walk in customers, fleet accounts, non-taxable accounts or wholesale accounts. Choose from a pre-set profile for every situation and use preset charges to help your business account for other costs you should re-coup with each repair. Web-Est uses one of the most respected sources of collision information in our industry. We include labor and paint times, part numbers/price information as well as under hood dimensions for all current and older model vehicles. Web-Est gives you the ability to include as many photos as necessary on your estimate, allowing for smoother repair cost settlement between you and an adjuster or owner. Easily choose parts to repair or replace, including: part pricing, labor times and your paint times (single stage, clear-coat, three stage or two tone) you can even choose to add edging, underside, and blending in any combination. Web-Est's collision estimating software gives auto body shops the ability to write an estimate from the shop, in the field or while working at home. 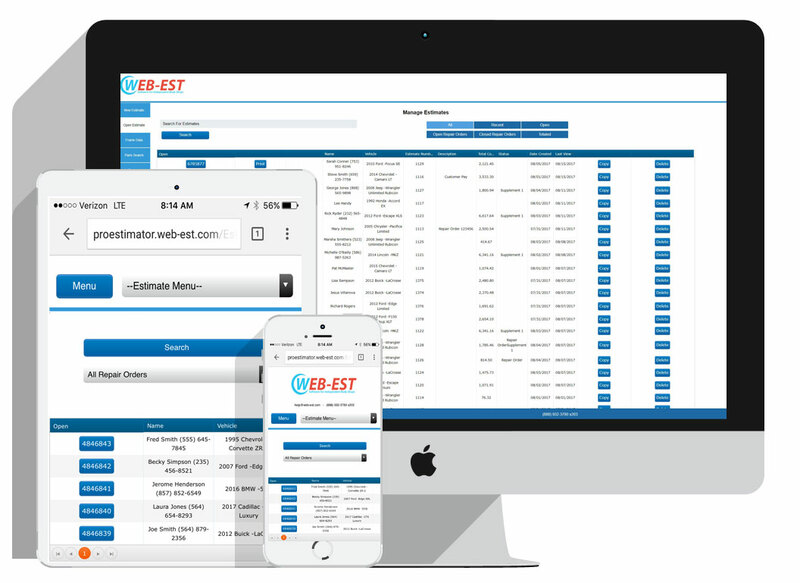 All you need is your log-in information and you have access to your estimating program anytime, anyplace. Web-Est includes most aftermarket vendor’s parts information free of charge. If there is a vendor you are working with, and you do not see them listed in the system, simply let us know, and our Data group will work to get that companies information added to the system. Web-Est is an online product. All of our updates are made instantly! There is no need for a new computer, software to upgrade or application to download. Mitchell Full Frame and Opening Data. Available to Web-Est customers as an ala carte option, this information is universal and can be used with any frame machine/pulling device. Ask your Web-Est representative about adding Frame Data to our account.